I am sitting here with a stiff arm after having my flu shot, the nurse did a great job but she warned us about the stiff arm. So happy I chose to have it in my left arm! 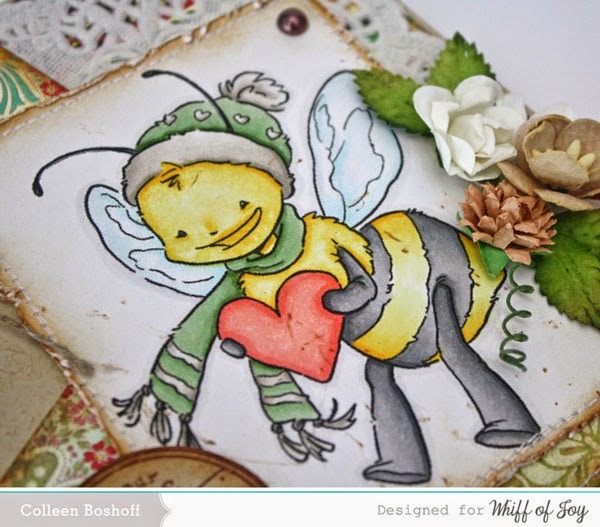 Well enough about my complaining, I have another card to share with you, this is WOJ's 'Bee Mine - Simply Maya'. The papers are Basic Grey 'Hello Luscious', I've used the stunning new WOJ 'Large Nested Tag Die-Light', WOJ 'Vintage Linen Button Twine', WOJ 'Feathers and Swirls' charm, WOJ 'Festive Occasions' sentiment stamp, flowers are Wild Orchid, Kaisercraft and Whiff of Joy, doily from my stash and a pearl to finish it off.